Wow. That's a really lovely view. If you like you can link it up on this weeks "Through my Lens" Link is below. A few hardy souls still out there. What a nice view and so many people out enjoying it. Oh, what a terrific place, Jose!! I think I would enjoy being there any day!! Thanks as always for sharing the beauty! I hope you have a great new week!! Enjoy!! It does have a different mood from your shot of yesterday. Not so very sunny... But a wonderful shot, Jose. You got a sweeping view of a majestic vista! I can imagine on a sunny day it would be even better! A really fine composition! I was going to say, what on earth happened to that blue sky that you always show??? It looks chilly and blustery. The Tagus bridge is so far away as to suggest isolation. Better, perhaps, to go inside. That dramatic sky has its own beauty! Enquanto o inverno aí chega, o verão aqui promete! Nice picture José! 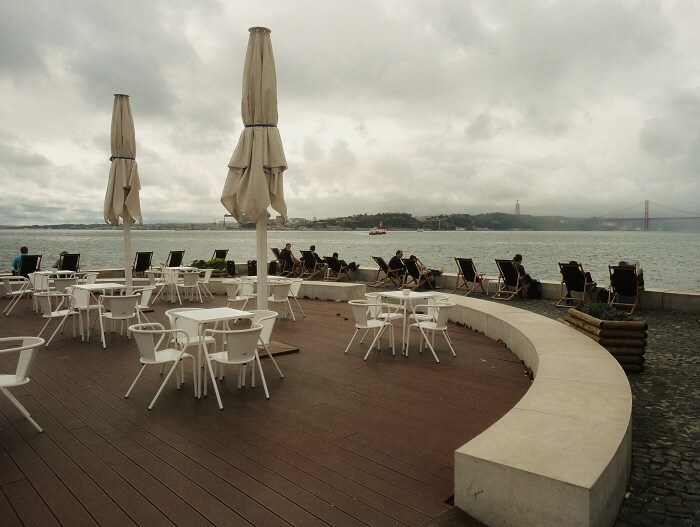 I like the white curve that makes the separation of the terrace bar and the viewpoint. Also nice contrast between the white in the foreground and the dark colours in the background. Great to see how the people are enjoying the seaview. A very nice composition here !